I'm probly going to piss some people off with this but...oh well:^) I'm going on a ram hunt here near San Anonio and I have to option to kill either a Corsican, Barbado, Texas Dall, bBlack Hawaiian or Painted Desert ram. Whitch one is the best lookin out of them. I am going to mount it because it is my first ram with bow and I want the best looking trophy to hang on the wall. Thaks for the help. Which ever one YOU think looks the best. Why do you want someone else to make that decision for you? I have a 1 1/3 curl black hawaiian that I took on a ranch hunt in Oregon during the winter. Looks very cool to me. my daughter took a Corsican when she was 12 years old. I had it mounted for her and it looks GREAT. I've saw all the others but the Corsican is the better looking mount 'in my opinion'. Any of them look great on the wall. Pick the one you like best and don't look back. Good luck. Lonestararcher I sent you a PM. corsicans are the probably the prettiest. Zbone cant you read, it says debate free. I'd like to know what Matt asked. How does the exotic mutton taste? Zbone, What kind of sheep ARE you "doing"? This is rediculous the man isn't going on a high fence elk hunt . this is no different than the hog hunts the same people do that are knocking him. Get a life. A friend and I shot 3 merino sheep in Texas about 7 years ago. We butchered them there and brought everything home in coolers and took great care of the meat. Then we ate some. No kidding, I would prefer to eat a dozen rotten eggs over one of those steaks. Maybe it was just these particular animals, but it sure ruined any desire to ever kill a ram again, besides a Bighorn or Dall of course. LoneStar - Don't stoop to the level of Zbone. Name calling is not appropriate or tolerated on this forum. Good luck on your hunt, and post some pictures. You'll know it when you see the one you want. I'd take the first mature one that gave me a good shot. Might not be a case of taking your pick. I love the "Hawaiian" sheep thing. Never been an indigenous mammal in Hawaii but for the seals on the beach. If it's the Hawaiian sheep I know they're just pretty much feral sheep. They'll get some big ol curly horns though. Personally I really like the Mouflon, but that wasn't a choice. Texas Dall is nice. I've taken a couple of those. I'm not too familiar with some of the others. Painted Desert Ram? Sounds like a cross of several of the other sheep. Sheep interbreed pretty regularly, hard to keep a pure strain of anything. Then you can just make up a name and call em whatever you like! Have fun, shoot what you like and show us the pics OK? I would rather go on a 5 day bow hunt in South Dakota or some other place for whitetails. but thats just me. have fun and good luck. post the pic after ur done! "I'm probly going to piss some people off with this but...oh well:^)"
I don't think you will get any disagreement with that statement. SD in January??? Wow. I'd have to talk to Medicineman and get recommendations for arctic hunting. That's as constructive and positive as I can get about that! im not talking about january TD! im talking about mid to late oct. i dont want to go freeze my boys off for post rut hunting i would rather stay in bed than do that. I dont understand what would piss someone off about this question. Really you should decide when you get there. I have seen all the ones you mentioned shot by myself and friends except the painted ram. Most of the time everyone likes the look of different rams. I beleive there is an EXOTICS forum that this would be better suited in. It's still a sheep so what's wrong with the sheep forum? Heck,I'd shoot a dirty one and call it a Texas Stone. I've mounted all of the for mentioned rams for various customers. IMO I think the Painted desert ram is the neatest looking with the Corsican a close second. LOL! Texas Fannin? Too funny! Good one. What if I shoot one with a handmade longbow with wooden shafts fletched with feathers from a turkey I shot myself? 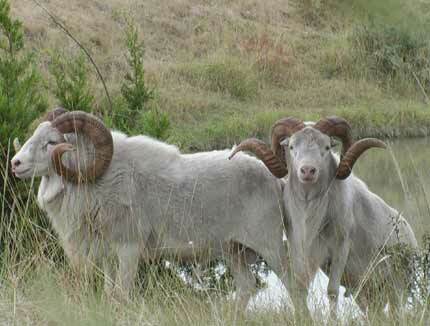 Google "texas dall sheep" and you will see they can be bought live for about $400-$500 for a 4yr old ram. never heard of these things before so it was a surprise to see they are a common hybrid mouflon. That makes them an exotic rather than a wild natived sheep? from the web.... "Texas Dall Sheep are all white Corsican (Mouflon cross) Sheep. These Mouflon crosses would probably not have ANY Blackbelly ancestry and tend to have more Rambouillet in their history. In fact, it was at the YO Ranch in Texas when some neighboring domestic Merino or Rambouillet rams got out of their pen and crossed with the YO Ranch Mouflon ewes. Solid White sheep were produced and these were eventually named Texas Dall Sheep. These sheep also appear to have retained the Supracervical (heart shaped) horns of the Mouflon more than the all black crosses (Black Hawaiian) and the spotted crosses (Painted Desert). Rams are horned and have manes. Ewes may have horns or be polled but both rams and ewes are true hair sheep and shed their winter "coats". These sheep are NOT related to the Alaskan Dall Sheep. The only similarity is their coloring and magnificent horns on the rams." They taste quite bad....tried marianting, smoking etc... still havent found anything yet to make them pass as edible. It doesn't really matter. Black Hawiians, Texas Dalls, Painted Desert, ect. They are all different color phases of the same animal the Corsican. Which in turn is a cross between the Barbados and the Mouflon. The Mouflon is the only pure blood of the "exotic" sheep. Kill these four and you have the Texas Slam. Add the Merino and the New Zealand Billy and you have the Big horn Slam. If your not a mutton fan then don't bother with the meat. There are plenty of people who would love to have it though. Don't worry a whole lot about what kind of animal you kill, just have a really good time and enjoy your hunt. Becarefull, you may get hooked on hunting these "easy" exotics. The one my stepson shot was free roaming and not in a high fenced area. It took us 2 hours just to get down off the cliff and get to him after he went down. Another 2 hours for recovery and we only had to move him about 200 yds. Hardest animal I have ever had to recover. Ok if I talk about it in this forum? Terry, Not really, but I bet it would be a great story for the EXOTICS forum! Well, Lonestar, you were right about one thing. You succeeded in p*ssing some people off, didn't you! I saw go have a fun time and decide on whichever type strikes your fancy once you're there. Have a good time, and don't let the "forum nazis" get you down. Chris, how do you know you will even get one? It's hunting and we all know nothing is guaranteed. You seem a little overconfident, talking about how you will mount it and such. I would just worry about hunting hard and hoping for a good opportunity. Hey, make sure you post your pic here in the sheep forum, it will make the holier than thou's even more angry. Since we're on this subject--let me throw a question at you guys. And I'm sorry I'm not trying to hi-jack this thread. If you like it keep it, if you don't throw it right back. In New Mexico, for those unsure we're above Mexico and below Colorado--sorry but there's one in every group that asks, we have 3 wild exotics: Barbary sheep, Ibex and Oryx. All these animals are wild, but imported. The oryx and ibex bunts, for the most part, are once-in-lifetime hunts. Barbary is over-the-counter. And the Ibex hunt is the hardest hunt in NM--period. None, are "canned" hunts. (Drum roll) So, can we talk about them here on this "wild" site or must I enter conversation about them on the "exotic" site? I got thick skin, just don't want to get "kicked" around for putting pics or talking in the wrong site. I also entered this same question on the "sheep and sheep" thread. Congrats, looks like you had a good time. Thank you very much...I really did have a great time. Since this is a Debate Free thread I'll reserve comment after watching that. I'll agree.....exotic mutton tastes terrible!!! !And it is tough and stringy. I marinated some and tried to make fajitas out of them. YUCK!!!! Bad idea. The "barnyard animal" thing really cleared up the video for me as they walked down the road. If they taste terrible, and you don't eat them, does that mean you are just killing the animal for the sake of killing. HOW SAD THAT IS!!!! That makes hunters look good. My motto is if you don't eat it, don't kill it, but hey, that's just me. I have yet to see anyone post that exotic sheep are good eating. Has ANYONE found them to be tasty and, if so, how did you prepare them? I don't have room in my house for mounts so I too am mostly interested in eating what I shoot. Thanks! DUDE! You are one STEALTHY bowhunter!!! Extraordinary stalking skills! Great camera work, as well! I AGREE with the "debate free" designation! The purpose was to get input on WHICH sheep species people like, NOT on the way in which it is/was taken. Answer the original post and you won't have ANY problem with the debate free designation. If you want to debate the manner of taking, START YOUR OWN THREAD (again!!!). Chris- congratulations on your ram. One thing really bothers me though, and that one thing is reading the sarcastic comments from so-called hunters. I expect to read comments like those on a PETA website, but when hunters bash others hunters, it's far more damaging than any animal rights activists comments. It thrills me to see a young person such as yourself out enjoying the outdoors. Congratulations again on the ram! Congrats my brother!!! dont let other people talk trash to you on some thing they havent done.Are you having it mounted? "I expect to read comments like those on a PETA website, but when hunters bash others hunters,..."
I must need a better monitor. I saw a person kill livestock (and I support his right as an American to do so), but the poor resolution must have caused me to miss the hunting part. Thank you for the kind words friends...I'm an E-4 in the Coast Guard and can't afford to go on a Wild Monster Big horn sheep hunt in NM somewhere. I take care of my wife then my addiction to hunting. It was a high fence ranch and it was $180 so thats the long and short of it. If I could afford a plane ticket and a tag to go on a "real" hunt as some think then I would have...If that makes me a bad person or hunter...then I'm sorry for offending yall. Just saw the video...no futher comments. Two words don’t ever belong together. Texas. Dall. Way to dig-up a 10 year old thread that belongs on the exotic forum "Ram hunter" 76. Shooting livestock does not make you a "Ram hunter." Poor choice in a handle. Go post your escapades on the exotic forum where you can talk about corn, feeders, and "stalking" your trophies that you pay for by the inch---be sure to remove the ear tags before you take your "hero" pics. Never had a sheep guide ask, "If I'd like to jump in the bed and shoot over the cab because they won't run." See the second YouTube link. Pathetic. Trivia comment to correct something incorrect from the 10 year old portion: Seals are not the only native mammal in Hawaii. The hoary bat is native as well.